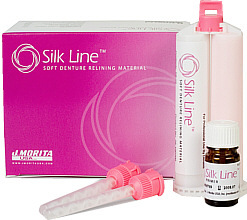 Silk Line™ is a new generation of silicone-based, soft denture relining material that has no odor or taste, and offers strong adhesion, exceptional durability and high resistance to tear, abrasion and discoloration. It is capable of withstanding wear up to two years. The cartridge dispensing system eliminates mess. Silk Line cures intraorally within four minutes. Permanently soft, with excellent durability up to 2 years. Easy to trim & polish. Direct chairside denture relining. Laboratory denture relining. Cushioning implants during healing process.